There were two distinct reactions in the Euro to today's ECB Minutes, released this morning. At first, the EUR jumped following initial headlines that the ECB acknowledged that revisiting the guidance would be "part of a the regular reassessment" going forward, but noting that any changes are premature at this stage. In this context, it was remarked that communication on monetary policy would continue to develop according to the evolving state of the economy in line with the ECB’s forward guidance, with a view to avoiding abrupt or disorderly adjustments at a later stage. However, changes in communication were generally seen to be premature at this juncture, as inflation developments remained subdued despite the robust pace of economic expansion. The language pertaining to the monetary policy stance could be revisited early this year as part of the regular reassessment at the forthcoming monetary policy meetings. In this context, some members expressed a preference for dropping the easing bias regarding the APP from the Governing Council’s communication as a tangible reflection of reinforced confidence in a sustained adjustment of the path of inflation. However, it was concluded that such an adjustment was premature and not yet justified by the stronger confidence. Predictably, this hawkish take prompted a kneejerk move higher in the EUR as algos bought the EUR. 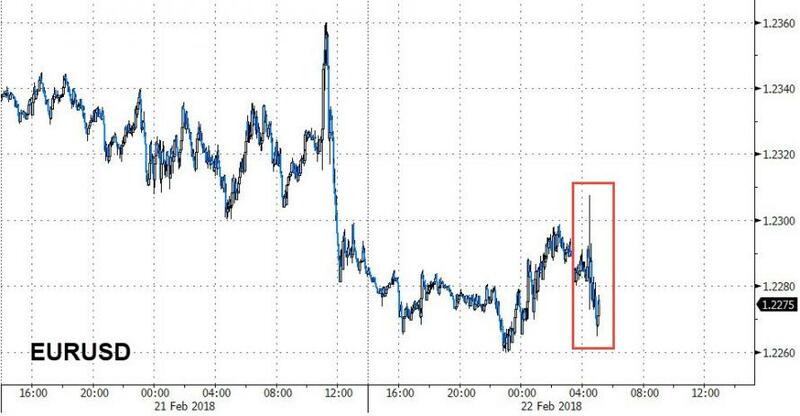 However, what traders focused on next was a rather explicit ECB concern over the weakness of the dollar, as the statement once again highlighted fears that the US administration was deliberately trying to engage in currency wars, something which Mario Draghi famously remarked on during the Q&A in the last ECB press conference, when asked for his response to Mnuchin's statement. Recall that toward the end of Draghi's Q&A on January 25, the head of the ECB took a direct swipe at recent US dollar jawboning, accusing Mnuchin, Ross, and essentially the entire Trump administration of verbally manipulating the USD, for not "complying" with the "agreed terms" which have led to euro gains due to comments from "someone else." As Citi said at the time, it is "fairly remarkable for a central banker of Draghi's standing to speak out like this to criticize another bloc's foreign exchange policies or practices." Fast forward to today, when the minutes of the January ECB meeting showed Draghi’s fears were widely shared among the bank’s decision makers. "Concerns were also expressed about recent statements in the international arena about exchange rate developments and, more broadly, the overall state of international relations," the ECB said. “The importance of adhering to agreed statements on the exchange rate was emphasised.” Those agreements explicitly rule out competitive devaluations. It was also pointed out that the bilateral exchange rate of the euro against the US dollar had changed more than the euro’s nominal effective exchange rate. This had led market participants to attribute recent exchange rate volatility more to the weakness of the US dollar than to the strength of the euro. However, explaining the US dollar weakness was not straightforward, given the strength of recent data releases and the fiscal and monetary policy outlook in the United States. This also had to be taken into account when considering the consequences of the exchange rate appreciation for the euro area economy. In addition, an appreciation relative to an invoicing currency such as the US dollar could be more important for the strength of the pass-through than suggested by its weight in the effective exchange rate. The volatility in the euro was, the account concluded, “a source of uncertainty which required monitoring”. And so, after all that, the EUR first spiked, then slumped, and was last seen trading just off session lows.